Its almost the new year and I think many of you have the same idea when it comes to buckling down and saving those pennies. I had posted this awhile back (under a different name) and some how the link for the printable has decided to take a break. I noticed an increase in traffic regarding this post on Pinterest so I wanted to make sure those of you that want to print this can. Happy New Year!! How many of you have heard of the 52 Week Challenge or 26 Week Money Challenge? If you haven't just search it on Pinterest it will pop right up. If you are trying to save but can't really organize yourself to do it consistently this is the perfect solution. It gives a goal for each week and if you are like me and know that your paycheck can vary you will be able to budget your savings more efficiently. I started the challenge in January but slightly modified it to better fit my saving goal. 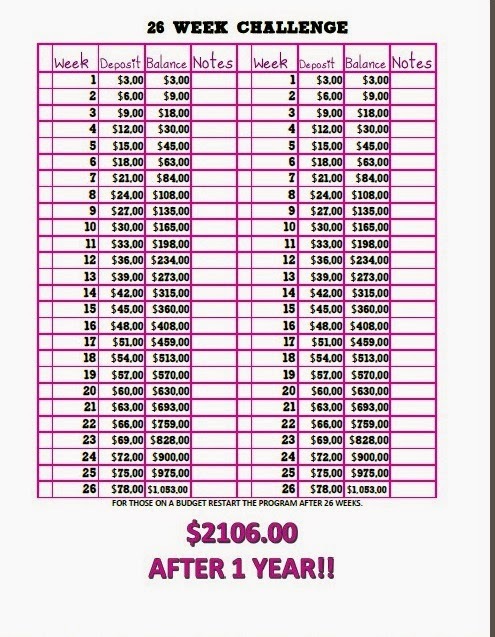 Instead of saving a dollar the first week like the 52 Week Challenge the 26 Week Challenge raises it to $3.00. I have broken the year up by doing it as two 26 week rotations to maximize my savings for the year. I am still saving more than if I just do the original 52 Week Challenge but it better fits my budget. Once you have put week 26 in the jar you just start the 26 weeks over. You can start on week one or if you want to work backwards start on week 26. You have a couple of ways to make sure you actually save the money and don't just spend it. You can place the money in a jar that you know will be hard to access or put it into a savings account that you don't use often. I did a combination of both, a water jug that was hard for me to take money out of and when I got to a certain amount I would place the money into a savings account. The perks of doing this are the dividends that I earn in my savings account! 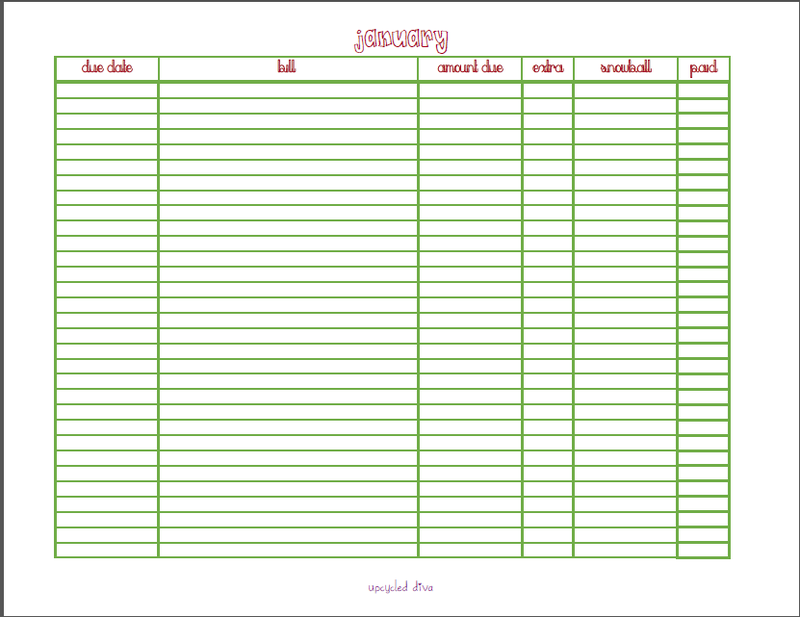 If you are up for the challenge use the above printable to keep track of your progress. Remember if your budget varies save the bigger weeks when you know there will be a little extra in your account. I apologize for my lack of posts over the last several, well a lot of months. After our move to Arizona I have not had a lot of time to dedicate to my non work life. Its been an adjustment living in the city and one that has not been good for me. But I am getting back into the swing of being creative and what better place to start than here! Today I want to talk about that annoying thing we do every month, paying the bills. I am the type of person that likes to be super organized about my bills. I have spent a lot of time looking for a good printable to keep track of all of my bills and just have not found one that I like. So putting on my thinking cap I decided to make my own. It is simple not a lot of frills. This printable gets the job done for me. I will explain the categories but if you already get the idea here is the link to download your own Monthly Bill Tracker. I like to order my bills by due date, its just easier for me to keep track of things that way so I put Due Date as the first column. Next you have the bill column, everything has a name right, so label it. Rent, Credit Card, Student Loan etc. You then put in the amount that is due every month. If you pay more indicate in this column how much extra you pay. You then have a column labeled snowball (I will explain below) and one for paid, check this box when you make your payment for the month. If you are like me and you put everything in a binder I have left enough room at the top of the page for your hole punches to not interfere with anything. I hope you enjoy this printable and happy planning!